RadGrid can take advantage of the AJAX technology to deliver an unsurpassed responsiveness and user experience. The main idea of the AJAX framework is the elimination of full-page postbacks. In contrast, only the relevant parts of the page are updated, without a disturbing refresh. Moreover, the markup that is transferred between the client machine and the server is reduced dramatically, which results in a significant performance improvement. Add a RadAjaxLoadingPanel to the Web page. Set the ShowStatusBar property of the grid to True. 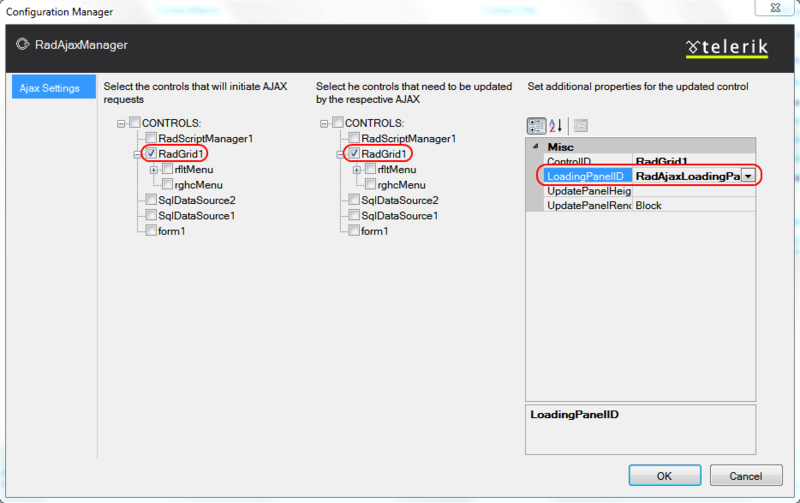 From the Ajax Resources section of the RadGridSmart Tag, click the Add RadAjaxManager... link. This displays the RadAjax Property Builder. Check the check box for the RadGrid control in the panel for controls that will initiate AJAX requests. Check the check box for the RadGrid control in the panel for controls that need to be updated by the respective AJAX requests. If you are using a RadAjaxLoadingPanel, select the RadGrid control in the second panel and set the LoadingPanelID property in the third panel to the ID of your RadAjaxLoadingPanel. RadGrid gives you the advantage of having your pages indexed by search engines (like Google, MSN search, Yahoo search, etc.) even when working in AJAX mode.